WHAT HAVE WE STARTED FROM? WE CHANGED THE COLOR OF THE WALLS, BEFORE THEY WERE BEIGE. IN THE FULL SUN THE WALLS EVEN LOOKED APRICOT. WE GAVE THEM A NEW LOOK, BY PAINTING THEM IN GRAY AND WHITE PALETTE. THIS IMMEDIATELY CAST THE MODERN LOOK OVER THE WHOLE INTERIOR. WE PAINTED ONE OF THE WALLS IN A DARK CONTRASTING SHADE, ON WHICH THE DINING TABLE WITH ALL THE SURROUNDING CHAIRS HAVE BEEN BEAUTIFULLY EXPOSED. THE DARK WENGE SHADE OF THE DINING TABLE HAS BEEN REPLACED WITH A BRIGHT OAK VENEER. WE HAVE HANGED TWO BEAUTIFUL LAMPS OVER THE TABLE - SCANDINAVIAN ICONS OF DESIGN - COPENHAGEN PENDANT & TRADITION. THE DARK CHAIRS THAT MATCHED BEFORE THE OLD TABLE, WE HAVE REPLACED WITH MODERN SCANDINAVIAN CHAIRS WITH CLASSIC UPHOLSTERY. 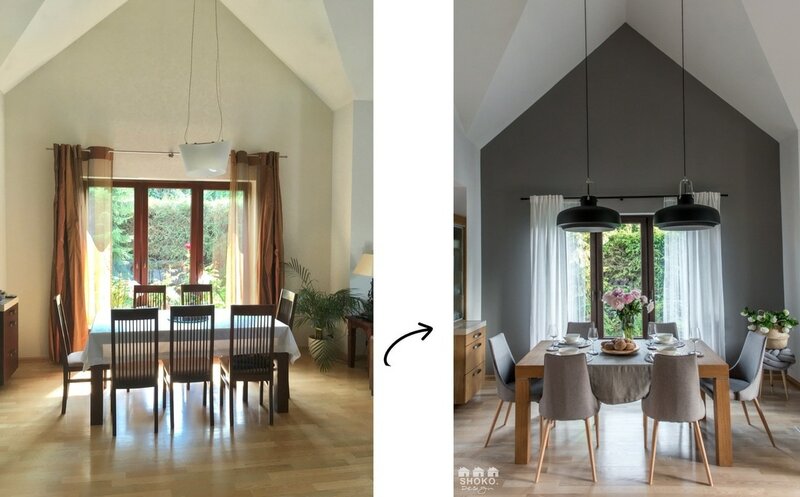 IN ORDER TO GAIN MORE CONTRAST WE HAVE HANGED WHITE CURTAINS ON THE DARK WALL, THAT BROUGHT FRESHNESS AND LIGHTENED UP THE WALL BEHIND. DEFINITELY THE MAJOR CHANGES HAVE HAPPENED IN THE KITCHEN AREA. SIMILARLY AS IN THE OTHER PARTS OF THE GROUND FLOOR, WE WANTED TO GET RID OF THE DARK COLOR OF ALL THE FURNITURE AND REPLACE IT WITH WHITE OAK AND TIMELESS WHITE. WE HAVE REPLACED THE BREAKFAST TABLE WITH A.HIGH BAR TABLE WITH HOCKERS AND HANGED TWO LAMPS IN THE SHAPE OF SALT CELLARS. THE DECORATION NICHE IS IN OUR OPINION ONLY A DUST RESERVOIR, THAT IS WHY WE GOT RID OF IT WITHOUT FURTHER THOUGHTS. THE WHOLE WALL HAS BEEN COVERED WITH VENEER, IN ORDER TO MAKE THE KITCHEN DEVELOPMENT MORE MODERN. 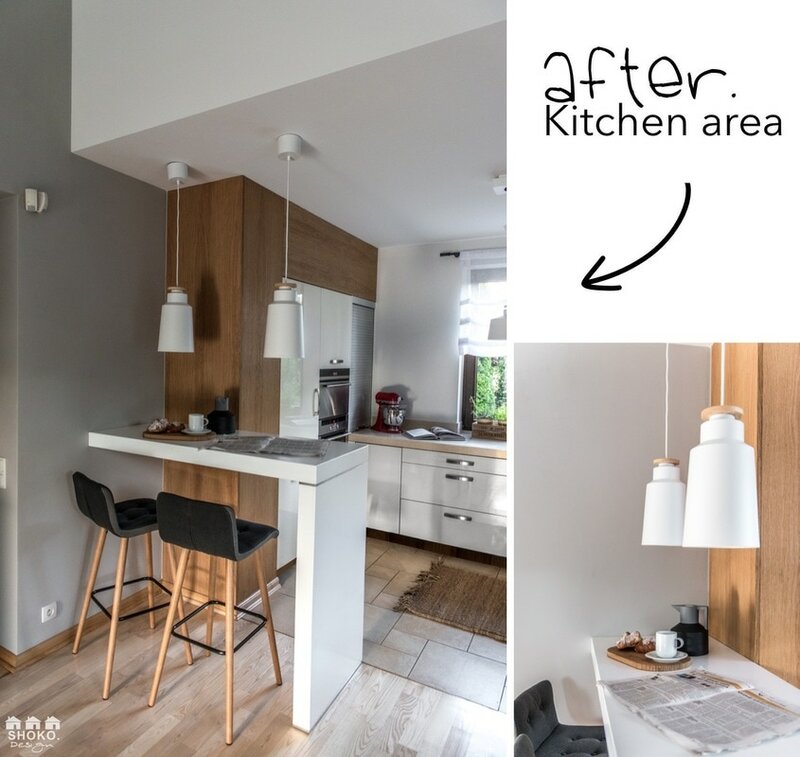 THE COUNTERTOP AND FRONTS HAVE NOT BEEN CHANGED, AS THE INVESTOR DID NOT WANT TO REMOVE THE MATERIALS, THAT WERE STILL IN A VERY GOOD SHAPE. WE HAVE HANGED TWO LAMPS IN A WHITE SIMPLE FORM WITH A WOODEN ACCENT, TO ADD COZINESS TO THE WHOLE COMPOSITION.